This Instant Pot Low-Carb Ground Beef Cauliflower Soup is a tasty but easy soup that starts with a pound of ground beef and uses ingredients you probably keep on hand! Use Pressure Cooker Recipes to find more tasty soups to make in the Instant Pot! Click here to PIN Instant Pot Low-Carb Ground Beef Cauliflower Soup! 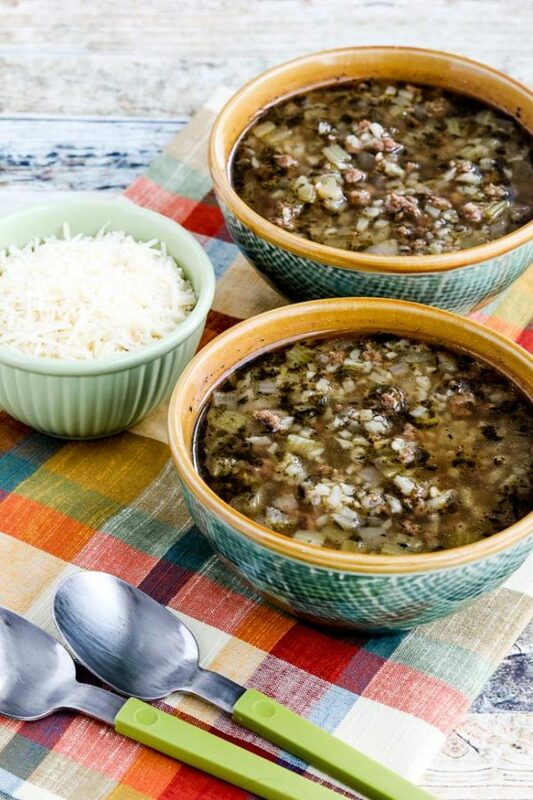 Way back in the archives of this blog there’s a recipe called Comforting Ground Beef and Barley Soup that used to be one of my favorites when I wasn’t thinking so much about carbs, and that’s the recipe that inspired this Instant Pot Low-Carb Ground Beef Cauliflower Soup. 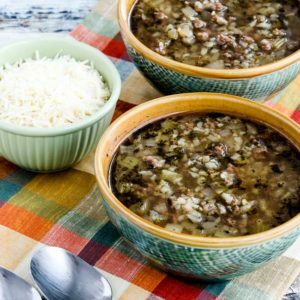 Both recipes are the kind of simple soup you might make when you have ground beef thawed out in the fridge and just want some soup that’s warm and comforting, and this soup was so quick and easy to make in the Instant Pot. 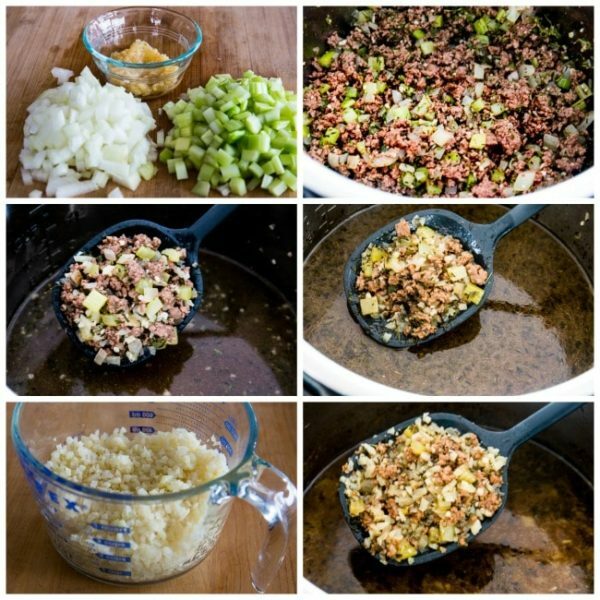 The ground beef and cauliflower gets added flavor from celery, garlic, parsley, thyme, onion powder, Worcestershire sauce, and a splash of balsamic vinegar added at the end, and we used frozen cauliflower rice to make it easy. 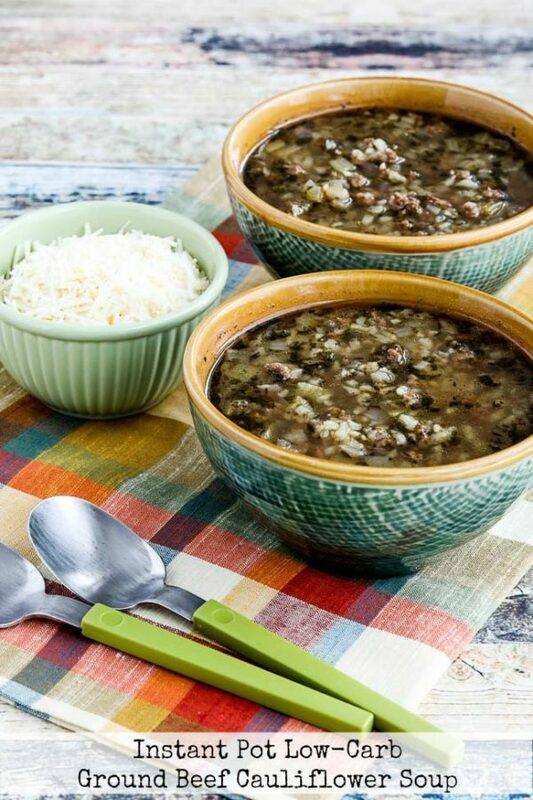 We enjoyed the Instant Pot Low-Carb Ground Beef Cauliflower Soup with a generous sprinkle of freshly-grated Parmesan cheese to add at the table, but you can certainly omit that if you want a dairy-free soup. Check out The BEST Low-Carb Instant Pot Soup Recipes or 50 Amazing Low-Carb Instant Pot Soup Recipes if you want more ideas for low-carb soup in the Instant Pot! Chop onion and celery and measure out 2 T minced garlic. Heat olive oil in the Instant Pot on SAUTE, HIGH HEAT, add ground beef and cook until it’s nicely browned, breaking apart with a plastic or wooden turner as it cooks. When the meat is browned, drain excess fat if needed and season with salt and fresh ground black pepper; then push browned meat over to the side, add another teaspoon of olive oil if needed, and add the chopped onion and celery. Cook 3-4 minutes, then add the minced garlic and cook a minute or two more. Mix the barely-cooked onion/celery mixture into the ground beef. Add dried parsley, dried thyme, onion powder, Worcestershire Sauce, beef broth, vegetable broth, and 1 cup frozen cauliflower rice to the pot. Lock the lid and set the Instant Pot to MANUAL, HIGH PRESSURE, 10 minutes. Let the pot natural release (or natural release 10 minutes and then release the rest of the pressure if you prefer. Turn the IP settings back to SAUTE, MEDIUM HEAT, add two more cups cauliflower rice and let the soup simmer until the newly-added cauliflower rice is cooked, about 10-12 minutes. (By now the first cauliflower rice will be mostly dissolved, thickening the soup.) Stir in 1-2 T balsamic vinegar (or any flavorful vinegar will work) and taste to see if you want more salt and/or fresh ground black pepper. Serve hot, with plenty of freshly-grated Parmesan cheese to add at the table! Instant Pot Low-Carb Ground Beef Cauliflower Soup is an easy comforting soup with ground beef, and this uses ingredients you might already have on hand! Heat 1 tablespoon olive oil in the Instant Pot on SAUTE, HIGH HEAT, add the ground beef and cook until it’s nicely browned, breaking apart with a plastic or wooden turner as it cooks. (Don’t use a metal turner. which might scratch the pot.) I used lean ground beef so I didn’t need to drain any fat, but drain some fat from the pot if needed when the beef is browned. Season the browned meat with salt and fresh ground black pepper, push it over to the side, add another teaspoon of olive oil if needed, and add the chopped onion and celery. Cook 3-4 minutes, then add the minced garlic and cook a minute or two more. Mix the barely-cooked onion/celery mixture into the ground beef. Stir in 1-2 T balsamic vinegar (or any flavorful vinegar will work, and taste to see if you want more salt and/or fresh ground black pepper. Serve hot, with freshly-grated Parmesan cheese to add at the table if desired. Use gluten-free Worcestershire Sauce if needed. 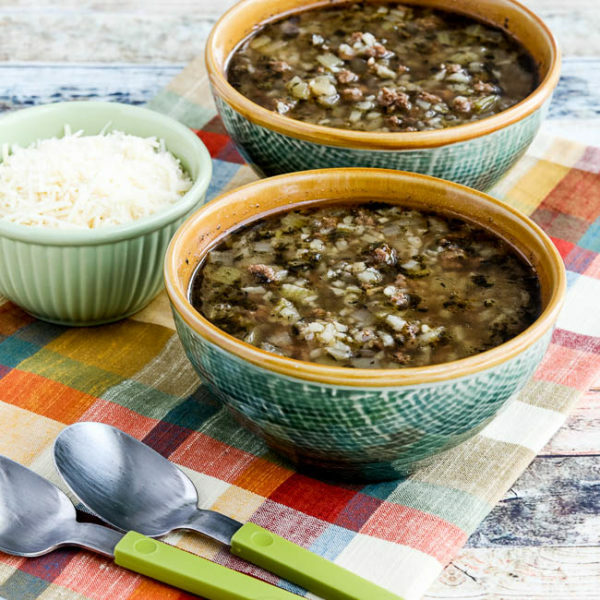 Instant Pot Low-Carb Ground Beef Cauliflower Soup is a good soup recipe for any low-glycemic or low-carb diet, including any phase of the South Beach Diet.